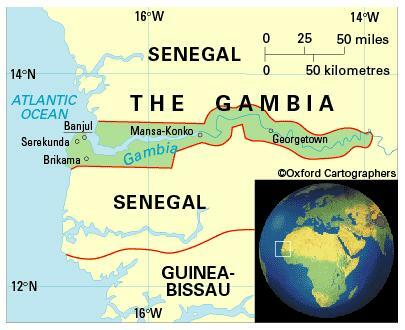 The Gambia withdrew its membership of the Commonwealth on 3 October 2013. Climate: The climate is tropical, with distinct dry and rainy seasons. The dry season at the coast, coinciding with the cooler weather, runs from mid-November-mid-May; the hot rainy season is from June-October. The weather is hot and humid inland, with midday temperatures reaching 38°C in March-June. The harmattan blows from the Sahara in January-March, bringing dust and haze. Environment: The most significant environmental issues are deforestation, desertification, and the prevalence of water-borne diseases. Erosion of the coastal sand cliffs, caused both by the sea and by sand mining for the construction industry, may also become an issue. Population: 1,776,000 (2011); 57% lives in urban areas; growth 2.9% p.a. 1990-2011; birth rate 38 per 1,000 people (49 in 1970); life expectancy 58 years (36 in 1970). Mandinka people constitute 42% of total population, followed by Fula (18%), Wolof (16%), Jola (10%) and Sarahuli (9%) (2003 census). There is also a community of Akus (Creoles), descended mainly from Africans freed from slavery in the early 19th century.